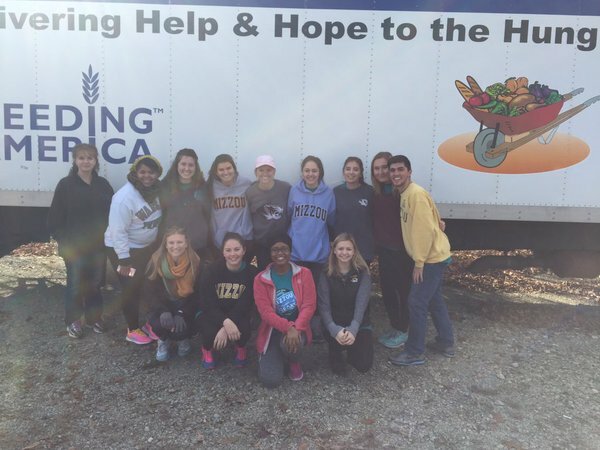 After we loaded all twelve participants in our vans – decorated with tiger tails; of course – we headed out to Madison County Missouri to take a weekend away from the hustle and bustle of Columbia to go out and do some good in the world. 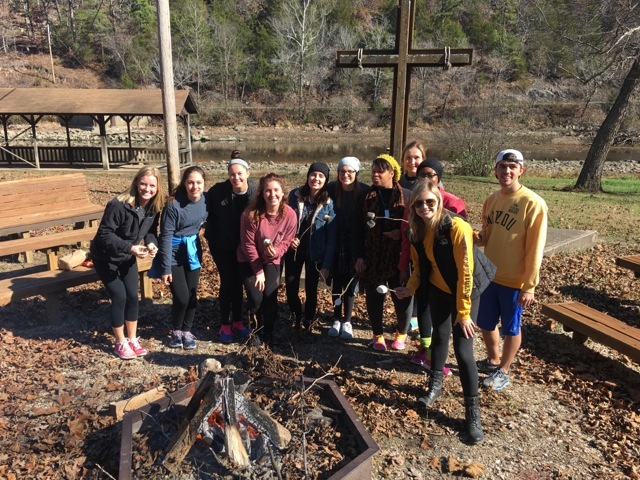 The weekend program of Mizzou Alternative Breaks is truly unique in that it dedicates its time to the great state of Missouri. The wonderful people at the MU Extension office in Madison County offered to let us sleep there for the two nights we would be in town. It was awesome to see Mizzou spirit in a whole new atmosphere. We settled in and got ready for our busy Saturday filled with service and new adventures. Saturday morning was a cold fall morning but it was beautiful nonetheless. We headed to Twelve Mile Baptist Church to assist in their mobile food pantry operation with Southeast Missouri Foodbank. Families large and small came from all over town to get food just before the holiday season rolls around. As a student with a campus meal plan and all you can eat dining locations minutes from my dorm, it was eye opening to see that not everyone is as lucky as college kids are. Hunger is a real problem in the United States and it was a rewarding feeling to be able to lift the burden of feeding people off of 127 families and over 400 people! Every one at the church just kept thanking us for our selfless act. Something so mundane, such as handing someone a bag of bread, can mean the world to another person. After our lunch break we headed to Camp Penuel in Ironton. The drive down the highway was gorgeous and scenic with all the mountains and fall colors around. We were greeted at the camp and ready to get to work despite our exhaustion. Camp Penuel has been providing FREE camping to over 82,000 inner city, at risk and underprivileged children for 40 years. We began to help clean up leaves in their eating area where they serve the kids lunch during the summer sessions. I quickly learned that yard work was no joke. I am typing this with sore forearms from raking for over four hours! Other students dug a trench to allow electricity to be provided to the new dormitory they are currently building. Our bravest participants climbed on the roof to help apply plywood to the new dormitory for the campers. After our long day we headed to a local restaurant and enjoyed dinner as a group. We quickly recognized a couple from the food bank that morning and they were so glad to see us. They came up to us to thank us again for our time and help that morning and told us that the bill was covered for dinner. We were all in shock as we sat their with our food. While we were the ones who were supposed to be giving back, someone gave back to us! It was so generous of them and we cannot thank them enough. DeNae Gitonga, Community Director of MU Extension offered up her home to us so that we could all shower before bed. Everyone in Fredericktown welcomed us with open arms and hearts. It was an amazing feeling for the twelve of us. A few employees at the Extension office cooked us breakfast before we headed back to Camp Penuel to finish what we started. 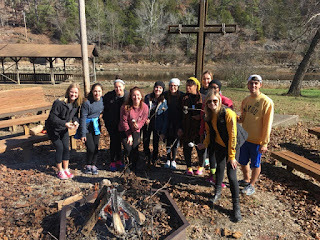 After raking more leaves and digging more of a trench, we were finished and were thanked with s'mores from the Missions director. Once again, SO generous. If this weekend has taught me anything, it is that service can be so rewarding. Twelve students came together not knowing one another and by the end of Saturday, we were all so close and had bonded a tremendous amount. Giving back in such a simple way was a great experience. The point of service is not to do it so you feel good about yourself. Its purpose is to help others in a way that you cannot even comprehend. I can say wholeheartedly that this weekend with MAB has changed my life and my perspective on a lot of issues – and I couldn't feel more grateful to this organization. p.s Check out our pictures from the weekend!